DrupalCamp Colorado is a fantastic opportunity to meet new people, see old friends and learn new things. All of this leads to great conversations with interesting people, so the after-party is a really important opportunity to continue those conversations. OK, it can also be a lot of fun. 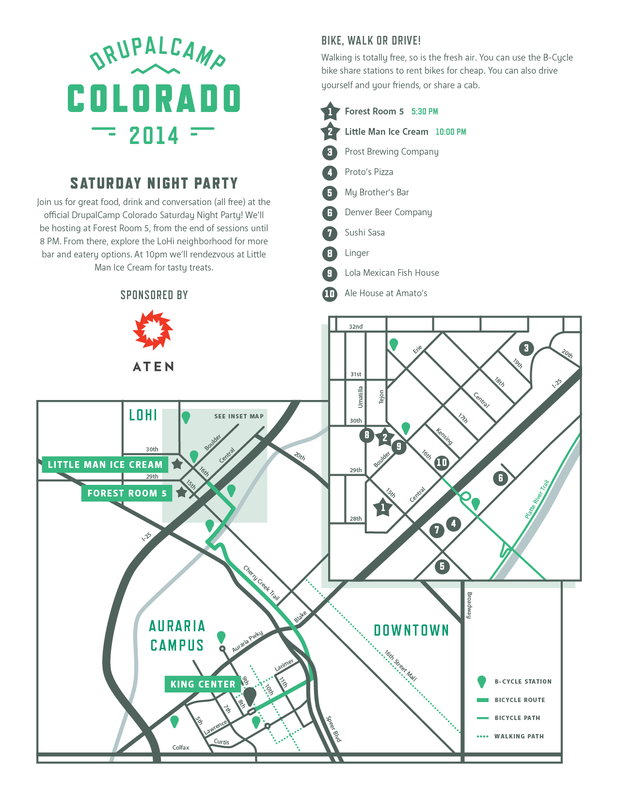 We're excited to announce this year's official DrupalCamp Colorado party, sponsored by Aten. Saturday night, we'll meet for free food, drink and conversation at Forest Room 5 immediately after sessions end (around 5 PM) until 8 PM. Use the walking and biking path along the Cherry Creek to enjoy the fresh air on the way over. You can even rent bikes for cheap at the many B-Cycle bike share stations on the Auraria Campus and drop them off at stations near Forest Room 5. At 8 PM, we will be exploring Denver’s LoHi neighborhood for more bar and eatery options. Then at 10 PM we’ll rendezvous at Little Man Ice Cream for tasty treats. Here is a map to help you find your way. See the Aten blog post for more details.